Swedish Foreign Minister Margot Wallstrom again lashes out at Israel, claims it is executing terrorists without trial. Swedish Foreign Minister Margot Wallstrom once again lashed out at Israel on Friday, accusing the Jewish state of “executing” without trial Palestinian Arabs who carried out stabbing attacks in Israel. Wallstrom’s comments were made during a 45-minute debate in the Swedish parliament, in which she replied to questions from parliamentarians on Sweden’s foreign policy. One of the issues that came up for discussion was the Israeli-Palestinian conflict, and three MPs asked Wallstrom why the Swedish government had adopted an unbalanced position which prefers the Palestinian position over the Israeli position. Wallstrom was asked why she did not condemn terrorist attacks against Israelis, to which she replied that she does indeed condemn attacks against Israelis, but then went on to level harsh accusations at Israel. "I reject and condemn the stabbing attacks. I think it's terrible and must not happen, and Israel has the right to defend itself and ensure its security," she said, according to Israel’s Channel 10 News. Media in Sweden extensively quoted Wallstrom’s remarks, Channel 10 reported, and the remarks raised the ire of Israel’s Ambassador to Sweden, Isaac Bachman. "Israel’s moral standards in the war on terror are at least as high as those of other Western nations which deal with the same threat,” Bachman said in a statement. “Israel manages to avoid civilian casualties much more than other Western countries. The focus on the way terror victims protect themselves diverts attention from the real horrors of terrorism. Instead, terrorists and inciters must be condemned and then acts of self-defense will not be required," the Ambassador added. Wallstrom’s comments are the latest in a series of anti-Israel statements she has made in recent months. Several weeks ago, the Swedish minister provoked a firestorm of criticism, when she appeared to blame the terrorist attacks in Paris on "Palestinian frustration" with Israel. Foreign Ministry Director General Dr. Dore Gold later summoned Swedish ambassador Carl Magnus-Nesser to give him a reprimand following the comments. Wallstrom also engaged in a back and forth with former Foreign Minister Avigdor Liberman a year ago. Liberman, in denouncing Sweden’s decision to recognize the Palestinian Authority (PA) as "the State of Palestine," said that “relations in the Middle East are a lot more complex than the self-assembly furniture of IKEA”. 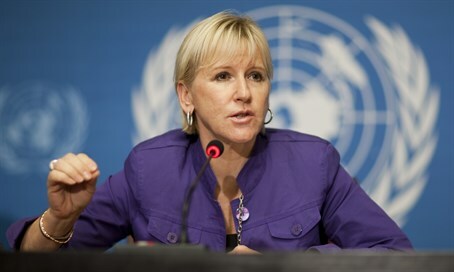 Following that incident, Wallstrom said Israel had overreacted to her country’s recognition of “Palestine”, accusing Israel of “irritating its allies”. "Israel has been extremely aggressive," she charged at the time, adding, "They have continued with their settlement policies, they have continued demolitions, they have continued with their occupation policies which entail a humiliation of Palestinians, which makes the (peace) process difficult."